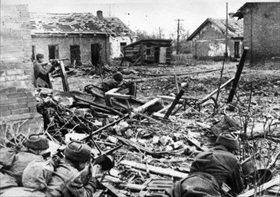 On this date in 1943 the Soviets launched Operation Ring, their name for the action that tightened the noose around the 250,000-plus soldiers of the German Sixth Army trapped in Stalin­grad (now Volgo­grad). Operation Ring had been pre­ceded by Oper­a­tion Ura­nus (Novem­ber 19–23, 1942), a one-million-man-plus Soviet offen­sive targeting the weaker Roma­nian and Hun­garian forces that pro­tected the Sixth Army’s flanks. In a sur­prise move two days before, this on the eve­ning of Janu­ary 8–9, 1943, Soviet Gen. Georgi Zhu­kov issued Sixth Army com­mander Gen. Fried­rich Paulus an ulti­ma­tum to sur­ren­der his troops, as well as those of his Ital­ian, Roma­nian, and Hun­garian aux­il­iaries. 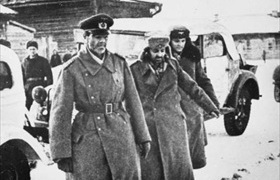 The ulti­ma­tum rein­forced the Red Army’s strangle­hold on the trapped Axis units—that all hope of a res­cue was hope­less and further resis­tance point­less. 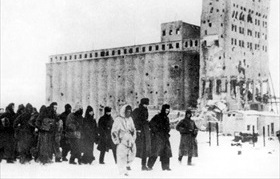 The Soviets pro­mised food, medi­cine, and guar­an­tees of safety to Axis prisoners and repatri­a­tion after the war. Yet Adolf Hitler, in the safety of Wolf’s Lair, his per­fectly cam­ou­flaged wooden bar­racks in the Rasten­burg swamps of East Prus­sia (now in Poland), would have none of it and coldly sent his sol­diers and offi­cers, as well as those of his Axis part­ners, to their doom. When the Soviets after five months of fighting finally lifted the Stalingrad siege in late Janu­ary 1943, between 650,000 and 750,000 Axis sol­diers and air­men had been killed or wounded, as well as 107,000 cap­tured. (Of the pri­soners taken at Stalin­grad, half would die on the march to Sibe­rian prisoner of war camps, and nearly as many would die in cap­tivity.) Though Red Army casu­al­ties are esti­mated to have been well over a mil­lion (one esti­mate is 478,741 dead and 650,878 wounded and as many as 40,000 civil­ians killed), the “Great Patri­otic War” had now shifted in the Soviets’ favor and the Axis powers would claim no further stra­te­gic victories in the East. In the imme­diate after­math of Stalin­grad, the Red Army launched eight winter offen­sives. After the “catas­tro­phe on the East­ern Front,” Minister of Public Enlighten­ment and Prop­aganda Joseph Goebbels noted in his diary that, for the first time, pre­mo­ni­tions of down­fall and death began to spread in Hitler’s inner circle. 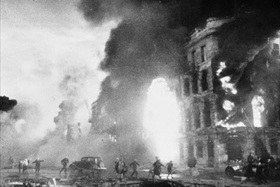 Left: A massive German strategic bombing raid on August 23, 1942, caused a firestorm, killing thousands of Stalingrad residents and turning the city into a vast landscape of rubble and burned-out ruins. 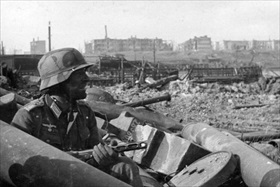 Right: Carrying a Soviet submachine gun, a German soldier seeks cover among the ruins of an industrial area in Stalingrad. 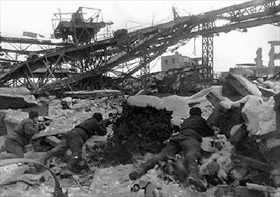 Right: Soviet soldiers crawl in the rubble of Stalingrad’s Red October Steel Factory. Left: Prisoners of war Field Marshal Friedrich Paulus and two staff members meet at the headquarters of Soviet 64th Army Chief, Lt. Gen. Vasily Chuikov, January 31, 1943. Ironically, Chuikov was in Berlin in April and May 1945, where he was the first Allied officer to hear of Adolf Hitler’s April 30th suicide. He accepted the surrender of Berlin’s garrison on May 2, 1945. Right: German troops as prisoners of war, 1943. Out of the nearly 107,000 Axis pri­soners captured in Stalingrad, only about 6,000 ever returned home after the war. Already weakened by dis­ease, star­va­tion, bone-chilling cold, and lack of medi­cal care during the en­circle­ment, they were sent on death marches (75,000 survi­vors died within 3 months of cap­ture) to pri­soner camps and later to labor camps all over the Soviet Union. Some 35,000 were even­tually sent on trans­ports, of which 17,000 did not sur­vive. Most died of wounds, dis­ease (particularly typhus), cold, over­work, mis­treat­ment, and malnutrition.